I will try to answer this as briefly as possible. Yes, the Church is against the burning of human bodies because this does not reflect the spirit of faith and the evangelical, biblical understanding of human worthiness. Junk, old rags and waste are burned; but a person’s body is not waste or an old rag! A believer’s body anointed by the Holy Spirit, which has received the Holy Spirit is God’s temple, a vessel of Eternal Life. A temple can fall apart or ceased to be used for prayer, but it is not burned. Both the living and the dead body of a person who believes in the Resurrection, is a seed of the resurrection. “It is sown a physical body, it is raised a spiritual body” (1 Cor 15:44). Having received the Holy Spirit, having communed with the Body and Blood of Christ, that body must reverently be placed in the ground as a seed of the future age. This body cannot be hanged on a tree, it cannot be given for birds to eat, it cannot be dumped into a cesspool, or be given to dogs or beasts to be torn apart or be subject to an artificial destruction. “You are dust, and to dust you shall return” (Gen 3:19). This law must be fulfilled in all cases, simply and without craftiness as a form of respect for the human body, returning it and the soul to God. The body’s decomposition must not depend on man but only on God, the Creator of life. Only He, the Master of the world, commands our life and our body. A person, regardless of his wishes, could of course drown, be consumed by fire, be torn to pieces by animals or have his body destroyed completely by some explosion. Those dying in a ship are sometimes committed to the seas. All this takes place in spite of the believing deceased’s will and in this he does not sin. The sin lies in the direction of the will. In an outrage against human bodies, Hitler burned millions of bodies in crematoria. This was not a sin on the part of the persons whose bodies these were: this was a testimony to their suffering. That’s the whole point. This is where the sin of opposing God is generated (perhaps even unconsciously). A person is “God’s property”, in body and soul. Created by God, redeemed by Christ the Savior, the person does not belong to himself but to God. The person is called to be the temple of the Living God in body and soul. In body, soul and spirit, the Christian is anointed by the Holy Spirit. 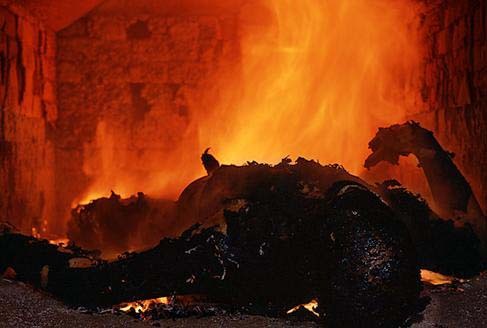 Only a believing person can understand where the sin of cremation lies. The sin is not in the fact of physical burning of the body but in the false direction of the person’s will to rule over God’s property, which his body is. A person sins when he looks upon his life as if it belonged only to him. A rather vivid manifestation of this sinful egocentric consciousness is suicide. The instruction to have one’s body cremated is a sign of a similar Divine disobedience. This leads a person to rule over his earthly life and his earthly body. In suicide a person rules over his earthly body, ignoring the will of God. Because of this, true Christians (as well as Jews who are faithful to their ancient Biblical belief) do not burn their bodies; believing Christians bury their bodies, which communed with the Holy Mysteries, bodies which became a part of Christ’s Body, reverently and devoutly, as was the Savior’s Body. Of course, the painting and decorating of the dead body (as practiced in America) doesn’t reflect the Christian faith and human dignity either. People do this from a pusillanimous desire to shield themselves and others from the reality of death. But the vision of death is the same will of God as the vision of life! As the seed of the life to come our body must reverently be placed in the ground. And the Church does this, proclaiming truth of the Resurrection. Those who do not know God’s will or are indifferent to it or are consciously opposed to it, burn their bodies. Pagans in India do this, mistakenly believing in purification, which comes from the natural form of fire, ignorant of God’s Grace and in the unique human personality (and from this they believe in the cosmic cyclical migration of souls). Symptomatic of this, the “League of Militant Godless” which was founded in Moscow shortly after the revolution, proclaimed as one of their basic aims in their cruel fight against God, the campaign for the cremation of the dead. This alone shows how repulsive cremation is to the will of God. It is necessary for believing people to rid their conscience from every theoretical and practical unbelief. It is necessary for a person living in the image of the world to come, to give his soul and body into God’s hands for all time. For the kingdom of God to come is not a partial but a complete fulfillment of God’s Will.